A wind advisory is in effect in the Las Vegas Valley until 8 p.m. Sunday, National Weather Service meteorologist Caleb Steele said. 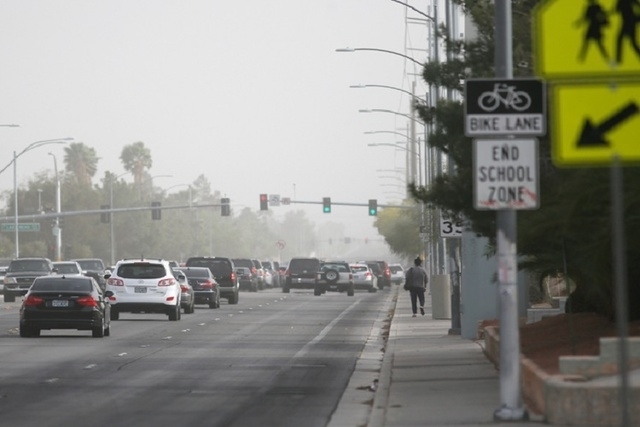 A wind advisory is in effect in the Las Vegas Valley until 8 p.m. Sunday, National Weather Service meteorologist Caleb Steele said. Winds will blow between 20 to 30 mph with gusts up to 45 mph. With showers expected until 1 p.m., Sunday will have a high of 66 and a low of 45. A cold front should move into the valley this evening and will bring cooler temperatures to start the week. Another storm system is expected on Monday. However, the wind speeds should gradually drop, Steele said. Temperatures will slowly rise as Tuesday’s high will be 68 and Wednesday is expected to reach 73 degrees, according to the weather service. Although the valley will warm up throughout the week, another storm system is predicted for next weekend with the possibility of more wind and rain, Steele said.